The parkland at Glenveach National Park has 14,000 hectares of lakes, glens and woods and includes two of the largest mountains in Donegal, Mount Errigal and Slieve Snacht. It is one of the finest gardens in Ireland and is spectacular when the “Rhododendron Ponticum” is in bloom in early summer. It is home to one of the largest herds of red deer in Europe and the Golden Eagle was reintroduced to the park in 2000, after becoming extinct 100 years ago due to over hunting. 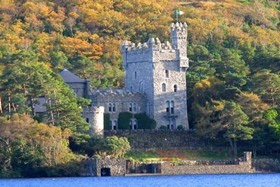 The castle was built in 1870 has a four storey keep. Tearooms serve morning and afternoon teas.